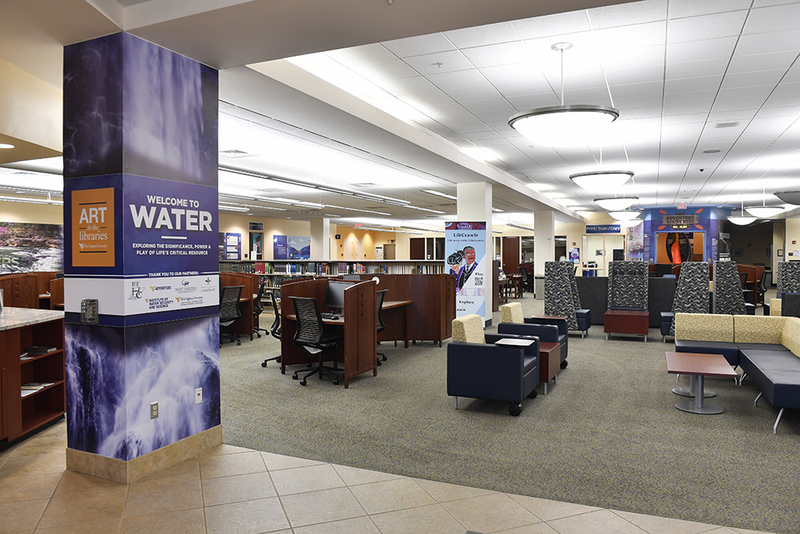 Throughout the 2018-2019 academic year, the West Virginia University Downtown Campus Library is hosting WATER: A Cross Disciplinary Exhibit Exploring the Significance, Power and Play of Life’s Critical Resource, a collaborative, cross-disciplinary exhibit that explores the power, control, scarcity, abundance, play and impact of water in its various forms. “We are thrilled to bring together such a diverse group of talented people each with a wealth of knowledge and expertise in their respective fields as we push off into this year-long trek to learn about and better understand the myriad issues that surround water,” said Sally Deskins, exhibits and programs coordinator for WVU Libraries. The exhibit begins on the Downtown Campus Library main floor and winds up through the staircase and into the Atrium. Visual displays of scholarship, fieldwork and art by more than 20 contributors from across campus and the community cover themes ranging from environment, adventure and creativity to impact, management and pollution. Beginning this exhibition has been a bit of an exploration into unknown territory. While Deskins has expanded the Art in the Libraries program with projects that pull together scientists and artists, WATER adds more parts to the equation – adventure sports. Take a hydrologist and a painter and introduced a river guide. 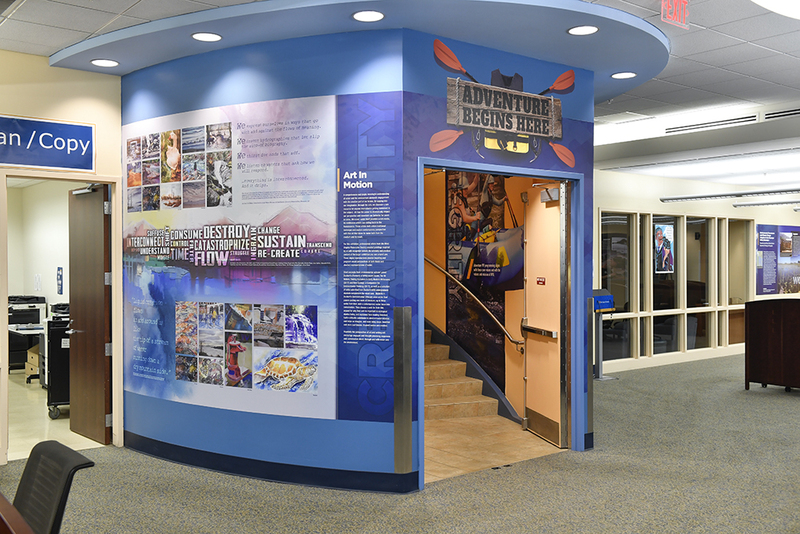 “When people first see the kayak, paddle board and whitewater-theme murals in the main stairwell, we hope it raises their interest in joining us on this adventure,” Deskins said. Complementing these exhibits is a series of lectures, panel discussions, events and other programming scheduled during the fall and spring semesters. Collaborators include Adventure WV; College of Business and Economics; Davis College of Agriculture, Natural Resources and Design; Reed College of Media; Benjamin M. Statler College of Engineering and Mineral Resources; WVU College of Law; Department of English; Department of Geology and Geography; Division of Forestry and Natural Resources; West Virginia and Regional History Center; WVU Institute of Water Security and Science; Environmental Health and Safety at WVU; West Virginia Land Trust; West Virginia Water Research Institute; West Virginia Humanities Council; West Virginia Watercolor Society; and Friends of Deckers Creek. Milano Reading Room, August 30, 4-5:30 p.m. In celebration of World Water Week and in collaboration with the West Virginia University Humanities Center, the Libraries will host a panel discussion that includes scholars from Literature, History, Law and Philosophy presented with funding from the West Virginia Humanities Council. September 26: Kayak adventure led by Environmental Educator Megan Kruger and Environmental Poet Lowell Duckert. Visit adventurewv.wvu.edu for registration and details. Downtown Campus Library, September 27, 5-7 p.m. The West Virginia Water Research Institute (WVWRI), a program of the National Research Center for Coal and Energy at WVU, has been in existence since 1967 and serves as a statewide vehicle for performing research related to water issues. WVWRI is the premiere water research center in West Virginia and, within selected fields, an international leader. This year’s annual conference organized by the WVWRI will include a student poster session and reception at the Downtown Campus Library. Public is welcome to attend. The Downtown Campus Library will be one of the stops for the Campus Art Crawl. Browse the Water exhibit. We think you find it interesting, educational and maybe even invigorating.